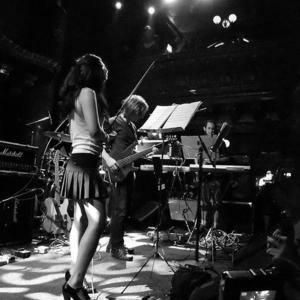 Kayo Dot is an avant-rock group originally from Boston, Massachusetts, United States (now based in Brooklyn, New York) that was formed in 2003 by Toby Driver after the disband of maudlin of the Well. They released their debut album Choirs of the Eye on John Zorn's Tzadik label that year. Its members are Toby Driver, Mia Matsumiya, Keith Abrams, Tim Byrnes, David Bodie, Dan Means and Terran Olson. Its members are Toby Driver, Mia Matsumiya, Keith Abrams, Tim Byrnes, David Bodie, Dan Means and Terran Olson. The music of Kayo Dot can not be accurately described by the limiting contemporary genre nomenclatures. Their songs involve complex instrumentation (composed by singer and frontman Driver), generally without refrain. They are substantially longer than typical rock songs, often ranging from 8 to 15 minutes in length. Kayo Dot's second album Dowsing Anemone With Copper Tongue was released in January of 2006. On May 6 2008, they released their third full-length, Blue Lambency Downward, on Hydra Head Records. Their fourth album, recorded in June 2009, named 'Coyote', was released on 20 April 2010 on Hydra Head Records. Their fifth album, 'Stained Glass,' was released in January 2011 by Hydra Head, with very little fanfare. Their sixth album, 'Gamma Knife,' was self-released digitally via http://kayodot.bandcamp.com in January 2012.